One of the hardest things about traveling (other than the fact that you’re carrying six bags while your child carries one stuffed animal that is apparently SO HEAVY) is trying to find a place to eat when you finally reach your destination. You want a place that has delicious adult food but is also super kid friendly and affordable. Not always the easiest combination to find. As a local resident of a popular South Florida beach destination, Fort Lauderdale, I am here to help you out. Below I highlight eleven great family-friendly restaurants to visit while on vacation, or even if you’re local like me. They are near popular tourist and kid destinations, or are worth the extra trip to get a great family meal. 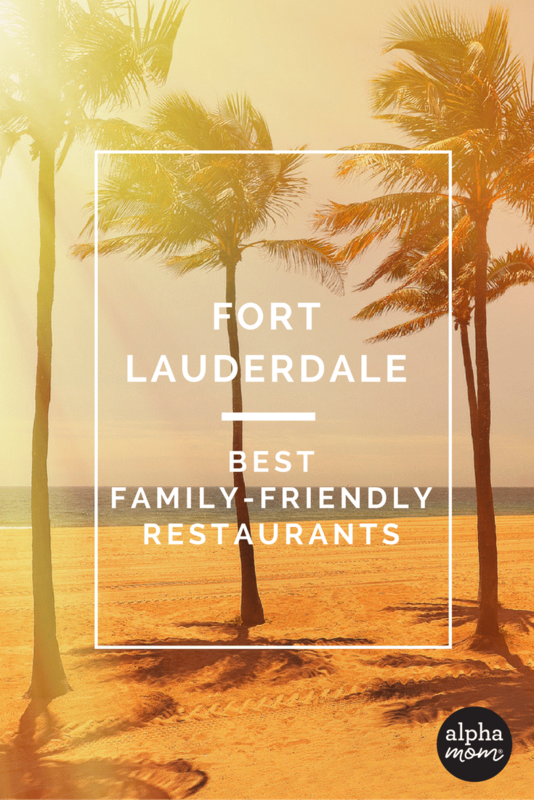 Some are popular family restaurants, but others are hidden gems that as a local resident I have been visiting with my family (of five young kids) since I moved to Fort Lauderdale. From almost the moment I moved to South Florida, I’ve been hearing about Jet Runway Cafe. That’s because it’s a super cool kids spot that locals love. This destination restaurant is at Florida’s Executive Airport and you can actually watch small planes land and take off while you eat. So the entertainment is built right in! I was worried about noise but the runway is far enough away that it isn’t a problem. Just note that it’s only open for breakfast and lunch (until 3 pm). So if you’ve got a future pilot in your family (and even if you don’t), this is a great place to check out. We went to Jet Runway Cafe for lunch on a Saturday and there was no problem seating a big party. I’ve heard from friends that breakfast is delicious and we found the lunch options were good too. 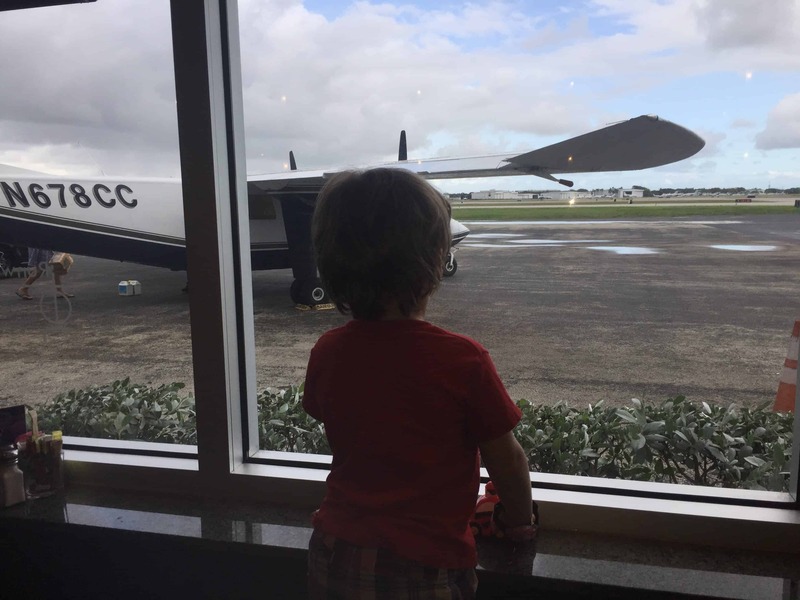 I had trouble keeping my 3 year old in his seat because he just wanted to look at the planes but no one at the restaurant seemed to care at all that he was roaming around. This is definitely a fun destination spot for breakfast or lunch if you are in Fort Lauderdale. Kid’s Menu: There is a very cute kid’s menu where items will run you between $6 and $8. Breakfast is standard fare and for lunch, kids can choose grilled chicken, PB&J, chicken fingers, grilled cheese, mini cheeseburgers, a corn dog or mac & cheese. All the lunch options came with two sides. Kids can choose between a fruit cup, veggies, sweet plantains, sweet potato fries, whipped potatoes and french fries. Drinks cost extra (between $2 and $3). The kid’s meals come with a generous amount of food. And the thing I loved the best – the children’s food comes on a frisbee that you can take with you as a souvenir! Options for Kids on Adult Menu: There are a lot of reasonably price items on the adult menu that children would enjoy like burgers, wraps and a Jet Burrito (chicken, rice, beans and cheese – yum!). Activities for Kids: Watching the planes and the runway! Plus, the kids menu (which comes with crayons) has lots of activities like tic tac toe, a maze and connect the dots. There is also a fish tank near the entrance of the restaurant. Speed of Service: Quick. We got the adult food about 12 minutes after we ordered and the children’s food came just a couple minutes later. In general, I don’t like when the adult food comes out first but it was only a couple minutes and not an issue. General Kid Friendly Vibe: Very good. This place is clearly used to having a lot of children and they are not fazed by loud, rambunctious kids. Prices: The prices are pretty reasonable. There are salads for $12 to $15. Sandwiches run between $12 to $14. And burgers will cost you about $12.50. Kid’s Cups: Basic plastic cup with a lid and straw. Nothing fancy. Family Bathroom: Not an official “family” bathroom but the men’s room and women’s room only accommodate one customer at a time so it’s basically the same as a family bathroom. The bathrooms are very roomy, nice and clean. If they put some changing tables, it would be perfect! 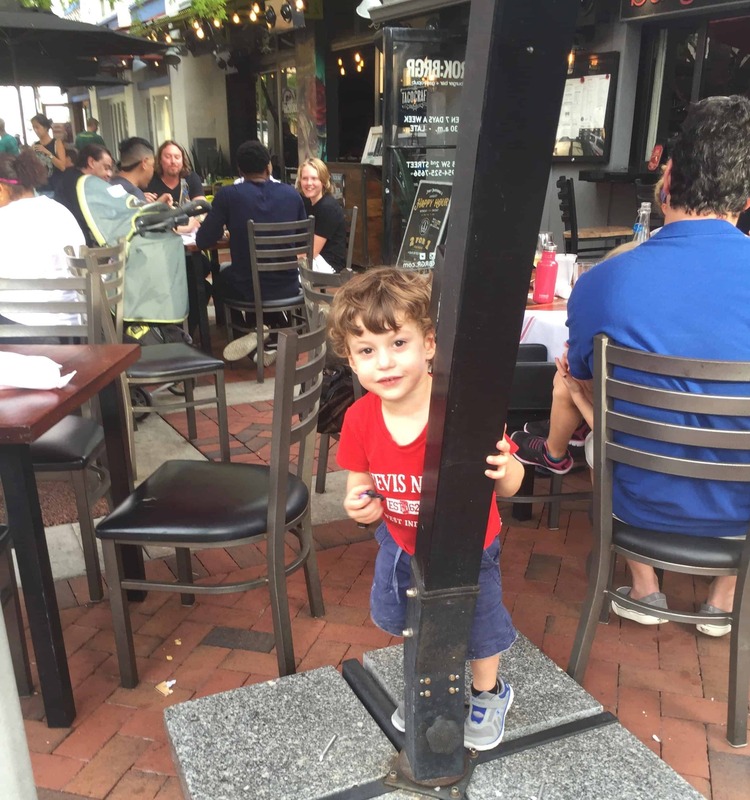 On a Friday around 6 pm, I tried to take my kids to Lulu’s Bait Shack (reviewed below) but the wait was 20 to 30 minutes and I knew that was pushing it with my never-took-a-nap-that-day 3 year old so we walked over to the Atlantic Surf Club. 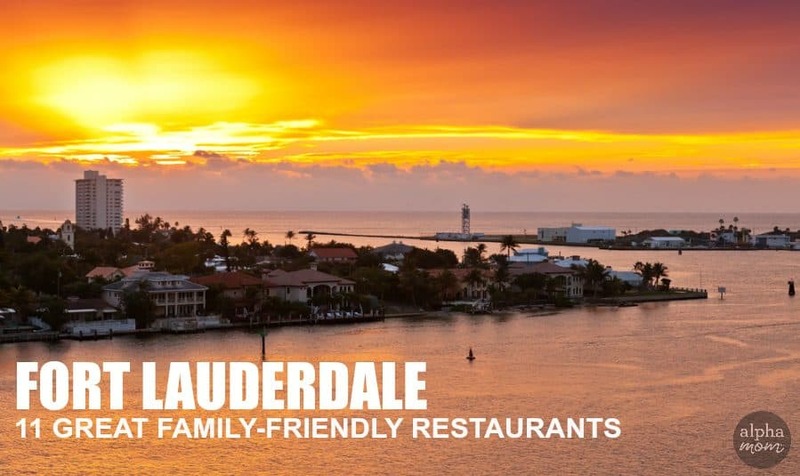 Both restaurants are in the same building complex on Route A1A (Fort Lauderdale Beach Blvd) which runs along the ocean and is a very popular tourist destination for families and beach goers. It is also very close to shops and little kiosks selling touristy beach stuff. The restaurant has an outdoor covered dining area and an air conditioned room as well. We sat in the outdoor area. It was very quiet at 6 pm on a Friday night which surprised me because I’ve been there for dinner at 8 or 9 pm and it’s bustling. The vibe was very relaxed and my 3 year old played on the floor for quite some time and nobody cared. The restaurant is kind of calming oasis in the middle of the Fort Lauderdale beachfront happy hour scene. There aren’t a lot of bells and whistles here for kids – just a beautiful view and a casual, yummy dinner. Please note, you will most likely need to park in the underground parking garage (behind the restaurant) and the restaurant does not validate. It cost us $10 for a couple hours. The garage is a little seedy but I parked near the elevator and felt safe with my children. High Chairs/Booster Seats: Yes to high chairs. No booster seats. Kid’s Menu: Options include mac and cheese, cheese pizza, hot dog with fries, mini burgers with fries and chicken fingers with fries. All choices are $8. They do not come with a drink. I easily substituted grilled chicken for the chicken fingers with no extra charge. Options for Kids on Adult Menu: Yes. My daughter ordered chicken wings off the regular menu which she loved. They also have burgers, thin crust pizzas, and three different kinds of french fries (skinny, duck fat and sweet potato!). Activities for Kids: None. But they don’t mind having children there at all. Speed of Service: Quick. The food came within 15 minutes. Servers: Very accommodating and friendly. General Kid Friendly Vibe: Good. This is definitely not a place that caters to children but it’s got a mellow, easy vibe that works for kids. Just know that if you go on the later side, it will be a lot busier! Prices: There is a big range in prices. There are sandwiches and burgers for $12 – $14. And then a pacific salmon entrée for $25. So don’t let your kid develop a test for salmon! I had super delicious fish tacos for $12. They weren’t huge but it was enough for me. Kid’s Cups: Basic plastic cup with a lid. Changing Tables: Yes! In both the women’s room and men’s room. Hallelujah! 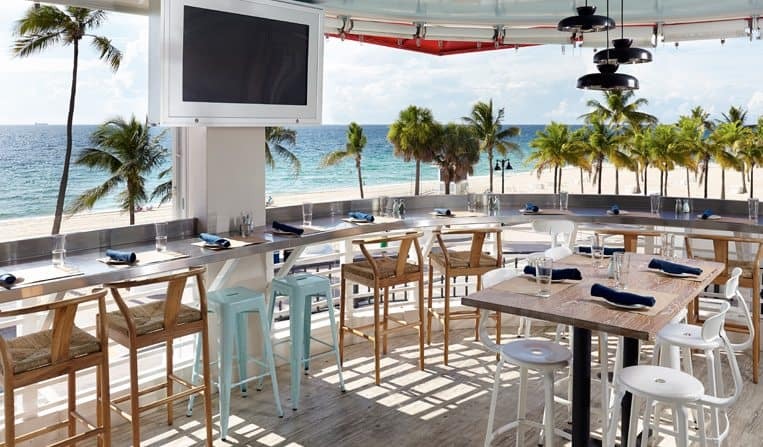 Like the Atlantic Surf Club (reviewed above), Lulu’s Bait Shack sits in a building complex right on Route A1A (Fort Lauderdale Beach Blvd) with gorgeous ocean views. This is part of a popular tourist strip in Fort Lauderdale and definitely has that touristy, time-to-party feel. 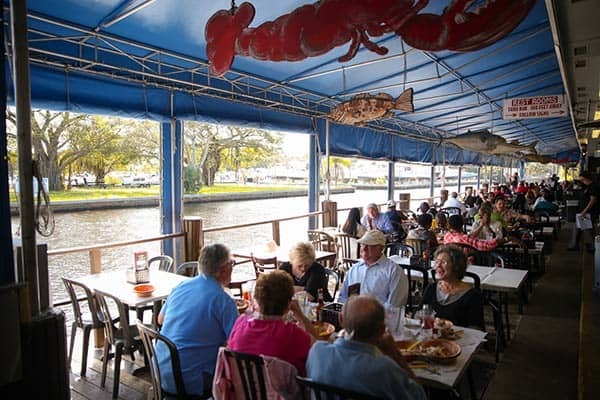 LuLu’s (a covered outdoor dining area) has a loud, festive cajun atmosphere. There is a big bar area and they serve lots of speciality cocktails in carved coconuts and giant fishbowls. There is no problem bringing kids here but this isn’t a place that specifically caters to children. There’s even a tattoo/ body piercing place next door if your night decides to go that direction. My 3.5 year old son loved watching the people on the street during dinner. 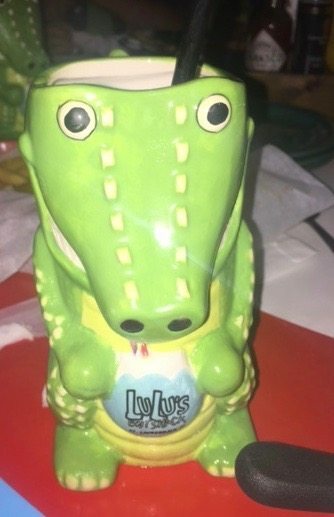 I noticed that customers were ordering drinks in these cute alligator cups and the waitress agreed to bring my kids water in those cups. We could have even bought them for $10 bucks a pop. If you are looking for a fun lively atmosphere, where no one will be bothered if your children make some noise, Lulu’s is your place. Like the Atlantic Surf Club, you will most likely need to park in the underground parking garage (behind the restaurant). It cost us $15 for a 2.5 hours. The garage is a little dumpy but I parked near the elevator which was well lit and felt safe. High Chairs/Booster Seats: High chairs, no booster seats. Kid’s Menu: All kids meals are $5.95 and come with french fries. Choices include mac & cheese, hamburger, chicken fingers, grilled cheese and peanut butter and jelly sandwich. No drinks included. I asked for a kid’s meal with grilled chicken for my son (who has allergies) and was charged $8.95 (instead of $5.95). Options for Kids on Adult Menu: Absolutely. My 6 year old daughter was not enthusiastic about the kid’s choices so she ordered a shack salad for $7.95. My other daughter decided on 10 wings for $9.95. I couldn’t convince any of my kids to get the alligator bites. Activities for Kids: None. But it was no problem having the children there. Speed of Service: 20 to 25 minutes to get the food. It felt a little long but we had a big party. General Kid Friendly Vibe: Overall, it is easy to have kids there but you will definitely be mixing with tourists and party-goers. Prices: Lots of different cajun options from about $10 to $16. I was very torn between the Crawfish Etoufee ($9.95) and the Shrimp and Lobster Tacos ($15.95). They brought me a taste of the Crawfish Etoufee which was yummy but a little bit too spicy for me, so I went with the Shrimp and Lobster Tacos. They were pretty mediocre but the waitress had told me to order the Mahi Tacos ($14.95) instead. Next time, I’ll listen to the waitress. Kid’s Cups: Yes, tops for cups. Changing Tables: In the women’s room. Family Bathroom: There is a handicapped bathroom that for some reason is labeled “men’s room.” You could use it as a family bathroom if needed. 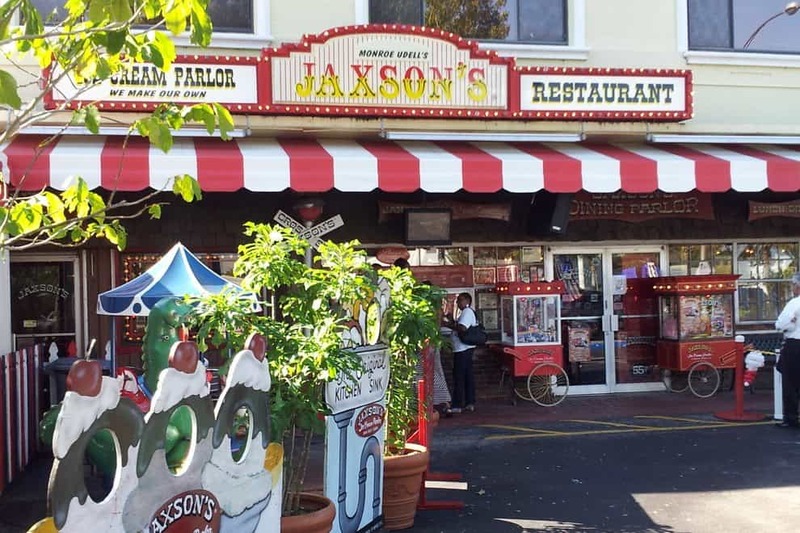 If you head to the Fort Lauderdale area, you’ve got to make a special visit to Jaxon’s Ice Cream Parlour and Restaurant in Dania Beach. Ever wonder what a child’s paradise looks like? This could be it. This place almost has a carnival feel with an old fashioned candy shop, popcorn on the table as soon as you sit down and a small merry go round outside. This place has an entire page of desserts and a generous portion of ice cream comes with every kid’s meal. For the adults, Jaxson’s features the kitchen sink dessert which is $13.95 a person and comes with a kitchen sink of ice cream (you choose from 40 different flavors!). 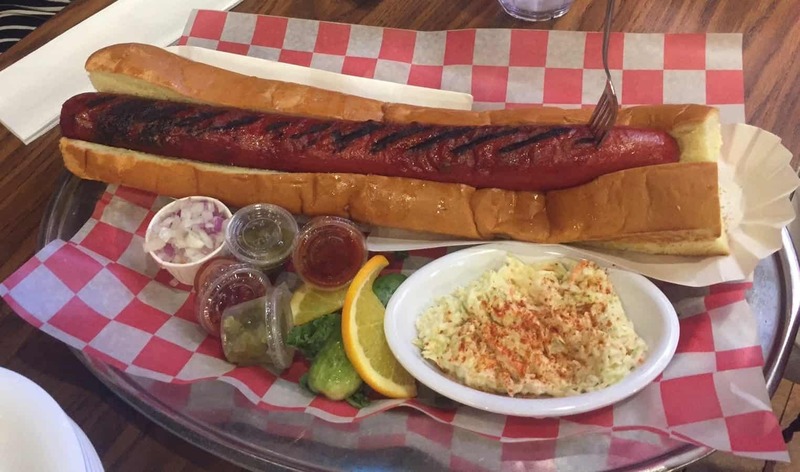 The restaurant also serves a 1lb artillery hot dog. So bring your hungriest self. Here comes the BUT. But it’s very very popular so if you don’t want to wait in long lines (and I mean long), come at off-hours. We went for lunch at 11:30 AM on a school holiday and had no problem getting seated (but it was packed when we left). If you come for dinner, get there at 4:30. You will be so happy you did. FYI, they do not serve alcohol at this restaurant. High Chairs/Booster Seats: Yes, it has both. Kid’s Menu: Options include a hamburger, cheeseburger, pizza, pizza with pepperoni, a hot dog, fried chicken sandwich, chicken fingers, grilled cheese and macaroni & cheese. Prices run from $7.50 to $9. Includes french fries and kid’s sundae. Drinks can be purchased for $1.50. The kid’s menu is for age 10 and under but my 12 year old daughter ordered a kid’s meal with no problem. They also substituted a piece of grilled chicken for my son with no added charge. Options for Kids on Adult Menu: Yes, absolutely! There is so much on this menu. Lots of salads, wraps, hot sandwiches, plus speciality hot dogs and hamburgers. Activities for Kids: Nothing at the table but they will be plenty busy eating popcorn. Plus, there is a candy shop to visit and some small rides outside. Just sitting there is entertaining with all the license plates and memorabilia on the wall. Speed of Service: The food came within 20 minutes. General Kid Friendly Vibe: This is a place made for kids! My children loved it and we will definitely go back. Prices: Reasonable. Most entree will run you about $13 – although there is a Titanic burger for $21.95 that comes with three 1/2 lb patties! I had a veggie burger for $12.25 that was really good. My friend had a yummy marinated chicken salad for the same price. Kid’s Cups: Plastic cups. No covers. Changing Tables: Yes! In both the women’s room and men’s room. Family Bathroom: Yes, both the women’s room and the men’s room are single bathrooms so you can take in your kids and have privacy. But there may be a line since there are only these two bathrooms for this very busy restaurant! 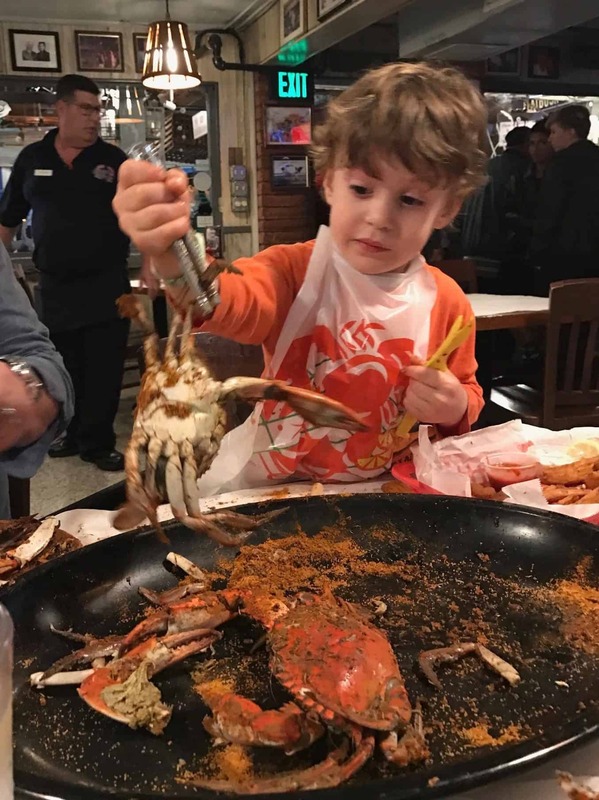 If you like hard shell crabs, the Rustic Inn Crabhouse in Fort Lauderdale is a really yummy place to check out with your family. It is right next to the Fort Lauderdale-Hollywood International Airport (like closer than economy parking) so expect to hear some big jets fly overhead. The neighborhood won’t wow you but you’re coming for the food and experience. The Rustic Inn is a very big and has an old school, hole-in-the-wall feel with framed pictures of movie stars on the walls and outdoor seating with a view of a canal. You would never know this place (around since 1955) is run by a New York restaurant group, Ark Restaurants. You don’t come here to save money. You come here for the relaxed, family atmosphere and some great hard shells. This is a very easy place to have some rowdy children. Because once you’re wearing a lobster bib, you can’t really judge anyone, right? If you have children, get there early. We went around 5:30 pm on a Sunday night and had no problem getting a big table for 7 people. By 7 pm, the place was bustling and people were waiting. High Chairs/Booster Seats: Yes, both. Kids’ Menu: The prices on the kids’ menu are a bit higher than your average restaurant. The most reasonable item is linguine or penne pasta for $6.95. Other choices include a hamburger ($8.45), cheeseburger ($8.95), fried fish ($9.45), fried clam strips ($9.45), chicken fingers ($9.95), fried popcorn shrimp ($9.45), bar-b-qua ribs ($12.45) or a minnow special (including fried popcorn shrimp, fried scallops and fried fish ($12.45). All the meals (except the pasta) come with fries, cole slaw and choice of fountain beverage. I did ask for just a piece of grilled chicken for my son who has allergies. I was told by the waiter there was only one chicken dish on the menu and it would cost me $18. I then spoke with a manager who said they could bring a child-size portion of chicken for about $8. They ended up charging me $11 but it was a nice size piece of chicken. Options for Kids on Adult Menu: Definitely! My 12 year old tried our lobster bisque and loved it. And if your kids like hard shell crabs, they will have tons of fun cracking, pounding and getting very messy! The Rustic Inn is famous for their garlic crabs so you might want to try those. We had Old Bay spiced steamed crabs which had a little kick and were super delicious. It was $60 for a dozen, but they were pretty big and fed two adults and two kids. I couldn’t sell anyone in my family on a fried alligator and frog legs appetizers for $14, though. Activities for Kids: They provide crayons and the table is covered in white paper. Speed of Service: Quick. This is a busy restaurant and they know how to get people in and out. Servers: Our server was a little gruff but he got the job done. General Kid Friendly Vibe: The place is so big and busy, they aren’t going to notice your screaming kid. Although if you are trying to move dinner along, don’t order hard shells because they are messy and take awhile to eat. Prices: Break out the wallet because seafood isn’t cheap. You will probably spend double what you would spend at some of the other restaurants reviewed here, but it’s perfect for a special outing. All the hard shells are market priced so ask the cost before you order so you don’t go into shock when the bill arrives. Kid’s Cups: Yes, cups with lids. Changing Tables: No changing tables. Family Bathroom: The women’s room and the men’s room are individual bathrooms so they basically serve as family bathrooms. Sinks are at the back of the restaurant for getting clean again after hard shells! When visiting Fort Lauderdale, you may find yourself heading a bit west to the town of Davie to check out Young at Art (a fabulous children’s art museum) or Flamingo Gardens (a wildlife sanctuary and botanical garden for the animal lovers in your family). And after visiting either of these great places, you will likely be hungry. And Mazzola’s is a perfect solution. This Italian restaurant is 8 minutes from Young at Art and 5 minutes from Flamingo Gardens. It’s a small place and I was a little nervous schlepping a rowdy group of kids in there but we didn’t seem to cause too much of a commotion. The place is filled with families and they were very accommodating. And even more important, the food was delicious. Kid’s Menu: Options include spaghetti with sauce or butter ($4.50), spaghetti with meat sauce or a meatball (($5.75), baked ziti ($5.75), stuffed shells ($5.75), lasagna ($5.75) fettuccine alfredo ($6.95), chicken parmigiana ($7.95) or chicken fingers ($5.95). The kid’s menu is for age 10 and under but my 12 year old daughter ordered a kid’s meal with no problem. She got the chicken parmigiana and loved it! They also substituted a piece of grilled chicken for my son and only charged us $5.00 for his whole meal. Options for Kids on Adult Menu: Yes, but there are so many good kid options (at reasonable prices) that it is better to stay with the children’s menu. But if your child want to try out the adult menu, my 12 year old loved the minestrone soup. And the personal pizzas ($6.95) are a great option too. Activities for Kids: No activities but family friendly atmosphere. Speed of Service: The food seemed to take awhile (20 – 25 min). But thankfully there were rolls! Yummy, soft rolls! General Kid Friendly Vibe: This definitely feels like a family place. The waitress’ adorable daughter even ran up to our table a couple times while she was taking our order. I didn’t feel self conscious about having a bunch of kids there. But it’s not a huge place. Prices: Pasta dishes will cost you $11 to $12. While the seafood and chicken entrees will be a bit higher (about $15 to $18). But they include rolls and a soup or salad. I ordered a shrimp marinara for $17.95 that was so delicious I need to go back and get it again. Very soon. Family Bathroom: No, regular bathrooms with stalls. 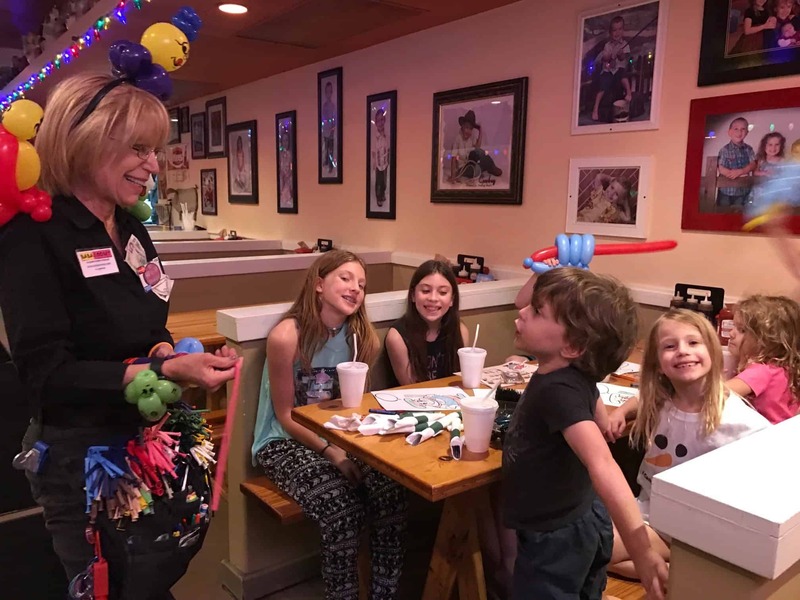 Like Mazzola’s (reviewed above), Rob’s Family BBQ is about 20 min west of Fort Lauderdale and an easy place to go after visiting Young at Art (children’s art museum) or Flamingo Gardens (a wildlife sanctuary and botanical garden). Rob’s BBQ is just 7 minutes from Young at Art and 12 minutes from Flamingo Gardens. The place is huge and has this sort of kitschy, country vibe. Personally, I don’t love the ambiance but it’s really a perfect place for a bunch of young kids. They have a cute, very affordable kids menu (with lots of options) where children can just circle a picture of their choice. And the restaurant has a balloon lady on Wednesday, Friday and Saturday nights. 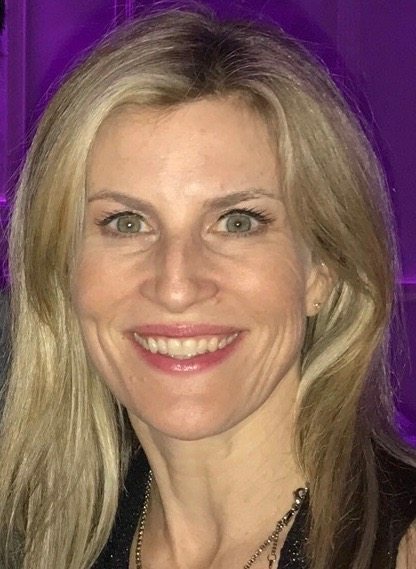 She is free but of course tips are encouraged. Kid’s Menu: Options include a hot dog ($2.99), chicken tenders plate ($4.99), baby back ribs ($7.99), chicken plate ($4.99), hamburger or cheeseburger ($4.99), spare ribs plate ($5.99), pork, beef or turkey plate ($4.99), mac and cheese ($2.99). Children can choose one side and the options are french fries, 1/2 corn on the cob, applesauce, baked beans or cole slaw. They also have their drink of choice which includes soft drinks, lemonade, milk or chocolate milk. And the kids get cookies at the end of the meal! My son has a lot of allergies and I didn’t even need to put in a special request because they had so many options on the children’s menu. Options for Kids on Adult Menu: Yes. There are sweet potato fries ($4.99), chicken wings ($9.79 for 10 wings) and mozzarella sticks ($5.99) but the kid’s menu is so affordable and varied that it may make sense to stick with that. Activities for Kids: Absolutely! There are crayons and kids can draw and color on the back of the children’s menu. And there is also a balloon lady who comes around to the tables while you’re waiting for your food. You don’t need to pay her but its nice to tip her. This activity kept my kids busy for a good 15 minutes while she made the balloons. Speed of Service: The food took about 15 to 20 minutes. But because my children were engaged with coloring and the balloon lady, it didn’t seem long at all. General Kid Friendly Vibe: This definitely feels like a family place. You won’t feel self conscious at all with noisy, spirited kids. In fact, I’m pretty sure the balloon lady is happy to have customers! Prices: The prices are definitely reasonable. Sandwiches are between $8 and $11. BBQ dinners are $11 to $14. I got the bang bang shrimp for $6.99 which was delicious and a side of collard greens for $3.99. All the sides are between $2 and $4. Changing Tables: There is a changing table in the women’s room. 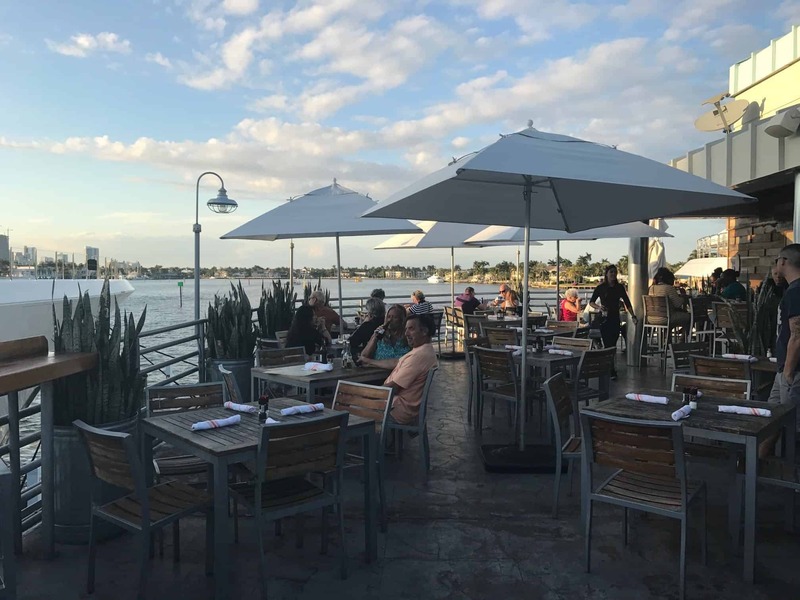 Pelican Landing is this casual waterfront bar and restaurant, tucked into a Fort Lauderdale marina with beautiful views of the Intracoastal Waterway. It’s part of the Hyatt but you won’t feel like you’re at a big hotel restaurant. It doesn’t feel touristy at all. Not surprisingly, this hidden gem is a little hard to find. You’ll park by the hotel and then follow Pier 66 by foot all the way to the end. You probably want to put a toddler in a stroller for the walk. Especially because the water is right there. Along the way are gigantic yachts and a beautiful view of the sunset if you time your dinner right. When we first arrived, we didn’t see any other children which caused my alarm bells to go off. But the staff was so laid back and more than glad to set up a big table for us that I soon began to relax. Like Rok:burger and B Square Burgers and Booze (both reviewed below) this is not that specifically caters to children but they are happy to have them there. We went on a Friday night around 5 pm and there was a musician playing guitar which was a little loud but not too obtrusive. Plus, it definitely masked any noise my children made – which is always a plus! High Chairs/Booster Seats: Yes, they have high chairs. No booster seats. Kid’s Menu: There is no actual children’s menu. But your waiter will tell you about the three options… chicken tenders, hot dog and grilled cheese. All cost $6. They come with fries and a choice of soda or juice. I also requested a child size portion of grilled chicken for my son who has allergies and it was absolutely no problem and the cost was the same. Options for Kids on Adult Menu: Yes but it will definitely cost you more. One of my daughters got chicken wings ($12) and another daughter got the hamburger ($15). The hamburger was big! This is a pretty small menu so you won’t find a ton of choices. Activities for Kids: None. So bring a few activities (coloring books, crayons, etc.) for younger kids. Speed of Service: The food took about 20 minutes. Servers: Very friendly. Our server was so nice and happy to fulfill all our requests. General Kid Friendly Vibe: Not a kids place. But they definitely won’t make you feel bad about having them there. This is such a lovely stop during a Fort Lauderdale trip and your kids can definitely come along. Prices: The prices are somewhat reasonable for a hotel restaurant but it’s a limited menu. We got the fish tacos for ($16) and lump crab cake sliders ($18). Both came with a choice of salad, fries or sweet potato fries. The side salad is amazing with mango, cashews and other yummy additions. The portions are quite generous. Other options include a chicken sandwich ($13), pan roasted salmon ($24) and skirt steak ($26). Family Bathroom: No, regular bathrooms with a stall. In the mood for Mexican food? Rocco’s Tacos is a perfect stop after a day of shopping on Las Olas Blvd. It’s got a fun vibe, tequila bar (for the adults) and a very kid-friendly atmosphere. I highly recommend you order the guacamole and chips. They make it for you at the table (order the mild for kids who don’t like spicy food) and it is really amazing. Even if your kids don’t dig Mexican food, they can still get by on some cheese quesadillas or chicken fingers. This place is a perfect combination of fun for adults but still caters to the kids. It’s a win/win. The restaurant is very spacious and we had no problem getting seats at 5 pm. Kid’s Menu: All children’s items are $6.50 with familiar options: hot dog, pasta with butter, quesadillas, chicken fingers, burrito and a taco. Most of the kid meals came with super yummy string fries that we are all still dreaming about. And, for my “pickier eater,” I asked them to prepare grilled chicken instead of the chickens fingers. It was no problem and there was no extra charge. Options for Kids on Adult Menu: Yes! The menu is very big so there are lots of choices for kids and adults. Activities for Kids: The kids menu comes with crayons and there are activities inside including a word search, a word scramble, coloring and a maze. It’s very cute and kept them busy for awhile. Speed of Service: It took about 15 minutes to get our food but we were very busy enjoying that guacamole and chips so we really didn’t mind waiting at all. Servers: Very friendly. They didn’t even look twice when I waltzed in there with five kids. And even if I couldn’t see my waiter, other waiters were happy to help me with whatever I needed. General Kid Friendly Vibe: Very good. Prices: It only cost us about $12.50 per person but that was 5 children’s meals, no drinks and I only got an appetizer. So expect to pay more if you order beverages and adult meals. My appetizer was the Rocco’s Tacos (3 mini tuna crudo tacos) which I loved. Kid’s Cups: For young children, they bring a cute plastic cup with a top and straw. Rok:brgr (pronounced Rock Burger) is just a couple blocks down the street from Fort Lauderdale’s Museum of Discovery and Science (which is a fantastic place to visit with kids). Rok:brgr often has loud music playing and definitely gives off a fun, bar vibe. They spray a cold mist outside to make the outdoor seats more enjoyable in Florida’s humid weather. We went around 5 pm on a Saturday and there were a few families there. And nobody cared that we had five kids in tow. My 3 year old happily walked around and played with his cars until the food arrived. This is not a place that specifically caters to kids but they certainly don’t mind having them there. If you need a burger and a drink after a few hours at the museum, you will not be disappointed. And if it doesn’t work for you, there are lots of other restaurants on this 2nd Avenue strip, so you’ll definitely find somewhere to eat. Kid’s Menu: All kids meals are $7 and include chicken tenders, hot dog, sliders and grilled cheese. The children’s meals come with heaps of fries. I promise, you can’t finish them. As for my “pickier eater,” I asked them to prepare a child size piece of grilled chicken and they were happy to do it. There was no extra charge. Options for Kids on Adult Menu: There was a mac and cheese bar on the adult menu that some of my kids would love to try. And other well priced items as well. Activities for Kids: No activities for kids although my 3 year old really enjoyed stacking the water glasses until we made him stop. Speed of Service: It took about 25 minutes to get the food which is long when you’re dining with kids. Servers: Our waitress was very friendly but didn’t quite understand that we wanted to get the heck out of there before we had a child mutiny on our hands. General Kid Friendly Vibe: Good but is not child focused. Prices: The burgers and salads are about $15 each so it’s pretty reasonably priced. I had a tuna taco appetizer for $12 and my husband ate a chopped salad with chicken for $17. Maybe a restaurant with the word “booze” in the name doesn’t immediately scream “kids place” but B Square Burgers and Booze is quickly becoming a go-to favorite for me in Fort Lauderdale. B Square has a swanky, cool (non-touristy) vibe and is kid-friendly. Like Rok:burger (reviewed above), this is not a place that caters to children s but they seem happy to have them there. There is outdoor seating with a fun bar right on busy Las Olas Blvd. Las Olas Blvd has lots of upscale shops and restaurants and is a must stop when visiting Fort Lauderdale. Rocco’s Tacos (reviewed above) is also on this stretch. Because of it’s bustling, fabulous location, you can still feel like your “in the scene” at B Square even if you are saddled with a job, mortgage and children. (And by saddled, I mean, blessed.) It’s a bit quieter inside the restaurant with the same contemporary feel. I’ve eaten here a couple times. The first time the service was excellent. More recently (during the Fort Lauderdale tourist season), the service was a bit more spotty. B Square is a newer restaurant and I honestly think they were overwhelmed by the influx of people. But I was impressed that the manager checked in on us at the end of the meal to see how everything went. Kid’s Menu: 12 and under and all options are $8.95. Choices are a hamburger, chicken fingers, mac and cheese, kobe hotdog and grilled cheese. All are served with fries. They easily substituted grilled children for my son with allergies at no extra cost. Options for Kids on Adult Menu: Yes, my daughter ordered coconut shrimp off the appetizer menu and loved it. There are also wings, sandwiches and salads. But mostly my kids stuck to the children’s menu. Activities for Kids: No activities. Speed of Service: The food took about 20 minutes. My kids were hungry so I asked for bread. They brought 4 pieces of bread for my 5 children. So obviously I asked for more bread. The bread was complimentary. General Kid Friendly Vibe: Not a place specifically for kids but the staff seemed happy to accommodate my children. I didn’t feel like I was bothering anyone and saw other kids eating there with their parents. Once the hostess saw I was dining alone with 5 children, she did suggest I order a glass of wine. Good idea! Prices: This is sort of upscale comfort food. Burgers are $13 to $19. There’s a Dad Bod burger for $15.95 that includes a fried egg. Sandwiches are $12 to $16. There are higher priced items too like ahi tuna tacos for $19 that I’m dying to try. I had a roasted chickpea appetizer for $9.95 that was delicious! Family Bathroom: No, just regular bathrooms with stalls.